16 Lights Mid Century Antique Patina Brass Sputnik Chandelier light fixture. 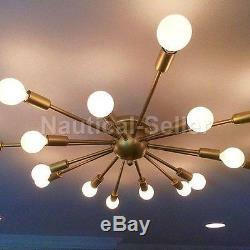 This is a Mid Century Antique Patina Brass sputnik chandelier starburst light fixture. We made this starburst light fixture with UL approved parts. With 16 arms/light this article measure 28 in diameter without light bulbs. 8W to 15w max recommended by us. Light bulbs are not included. Ceiling canopy is adjustable at different angels so you can hung this accordingly. All our light fixture are crafted by hand. This particular chandelier has been made with Brass material. Minor variations in finish are an inherent characteristic of such material and add to the beauty and uniqueness of the product. Premium quality Mid Century sputnik chandelier. Made of Pure Antique Patina brass. All Measurements Approx is : 28" x 28". Standard candelabra E12 light bulbs used this chandelier. Requires Sixteen (16) 15 watt bulb type A (not included). 125 voltage, 75 watt max With E12 socket rated. 240-250 voltage, 75 Watt max E14 Socket rated. Recommended bulbs are 7 watt to 15 watt. Incandescent Bulbs, Energy Saying, LED Bulbs. All Components are UL approved. The item "Flush Mount Modern Antique Patina Brass Sputnik Chandelier light fixture" is in sale since Monday, October 2, 2017. This item is in the category "Home & Garden\Lamps, Lighting & Ceiling Fans\Chandeliers & Ceiling Fixtures". The seller is "nautical-seller" and is located in ROORKEE, UTTARAKHAND. This item can be shipped worldwide.